Barry always has it RIGHT! The recession is well behind us now, and Wall Street seems to think this recovery should be all wrapped up. Consider this: The federal non-farm jobs report for June was pretty awful. The private sector created 57,000 jobs. Federal, state and local governments cut 39,000 positions (the eighth straight monthly decrease in government employment). We picked up a mere 18,000 net new jobs. Not a single forecaster in Bloomberg’s monthly survey of 85 Wall Street economists got it anywhere close to right. The most common reaction was “surprise.” That any professional can sincerely claim to be surprised by continued weakness — in employment, GDP or retail sales — was the only revelation. 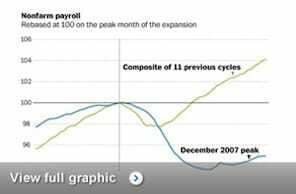 Let’s put the number into context: In a nation of 307 million people with about 145 million workers, we have to gain about 150,000 new hires a month to maintain steady employment rates. So 18,000 new monthly jobs misses the mark by a wide margin. Why have analysts and economists on Wall Street gotten this so wrong? In a word: context. Most are looking at the wrong data set, using the post-World War II recession recoveries as their frame of reference. History suggests the correct frame of reference is not the usual contraction-expansion cycles, but rather credit-crisis collapse and recovery. These are not your run-of-the-mill recessions. They are far rarer, more protracted and much more painful. First, asset market collapses were prolonged and deep. Real housing prices declined an average of 35 percent over six years, while equity prices collapsed an average of 55 percent. Those numbers were stunningly close to what occurred in the U.S. crisis of 2007-09. Second, they’ve noted that the aftermaths of banking crises “are associated with profound declines in employment.” They found that following a crisis, the average increase in the unemployment rate was 7 percentage points over four years. U.S. unemployment climbed 6 percentage points (from about 4 percent to about 10 percent), while the broadest measure of joblessness gained over 7 percentage points (from about 9 percent to about 16 percent). Again, they were right on the money. Third, the professors warned that “government debt tends to explode, rising an average of 86 percent.” Surprisingly, the primary cause is not the costs of bailing out the banking system, but the “inevitable collapse in tax revenues that governments suffer in the wake of deep and prolonged contractions.” They also warned that “ambitious countercyclical fiscal policies aimed at mitigating the downturn” also tend to be costly. Hmmm, plummeting tax revenues just as the government tries to stimulate the economy . . . does any of this sound familiar? It should. Read the rest here in the Washington Post, or on his blog, here. In conclusion, we are in for a long haul, no matter what we do, but austerity, or slashing government spending is the WRONG way to go, unless, like Republicans, you want to follow ideology and damn the little people, with no power, who will get hurt.